Dr. Robert Holloway is internationally recognized for his pioneering skills in robotic surgery, post-graduate training programs and excellence in clinical research. In addition to serving as Medical Director of the Gynecologic Oncology Program at AdventHealth in Orlando, he is a founding member of the Global Robotics Institute. 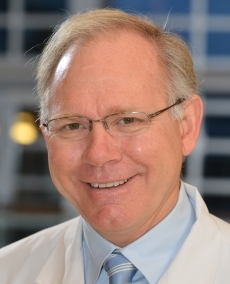 He routinely assists in the training of physicians from around the world in new surgical techniques and is a principal investigator for several clinical trials and projects aimed at advancing effective treatments for gynecologic cancers, including innovative investigations of pelvic sentinel lymphatic mapping that improve surgical staging, bio-assays that better predict response to oncologic drug therapies, and genomic markers for neurotoxicity that may improve quality of life for patients on chemotherapy. An acknowledged leader in his field, Dr. Holloway is frequently invited to lecturer at major universities worldwide on topics related to robotic surgery, pelvic sentinel lymph node mapping, and ovarian cancer therapies. Excellence in Oncology Award, Surgeon of Year Award, Best Doctors Award, Patients' Choice Recognition Award, Doctor Honoris Causa Recognition, FH GME Awards, Cassle Connolly "Top Doctors" Award, SGO Committees & Awards, etc. Dr. Holloway is passionate about evidence-based treatments for patients with gynecologic cancers. He uses state-of-the-art robotic surgery and therapeutic approaches to manage patients. He loves teaching & training young doctors worldwide and serves on various leadership positions both locally and globally. Impossible is just one opinion. With enough research and experience we can find solutions for difficult clinical problems. Note:- The list below is for reference purposes only and is subject to change. Please check with your health plan to confirm that Robert Holloway, MD is included before scheduling an appointment.